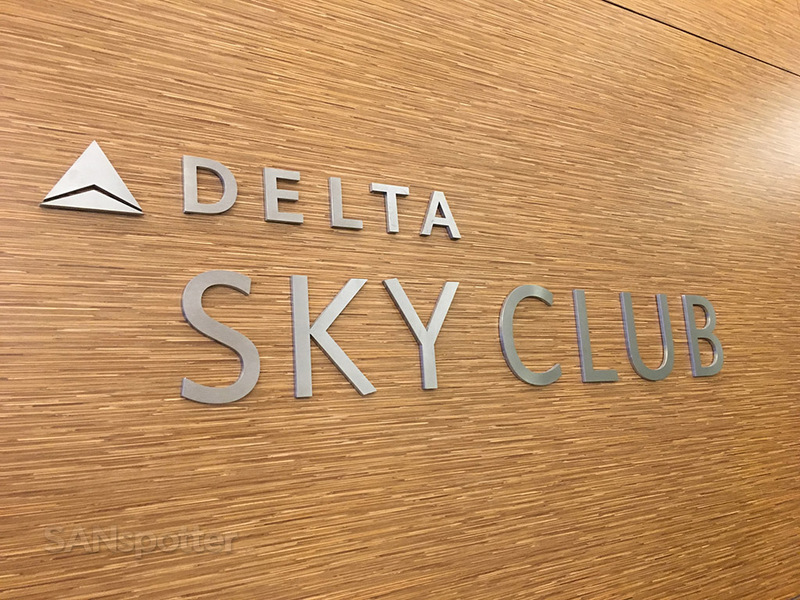 Visiting this Delta Sky Club here in JFK was a bit of an emotional roller coaster. 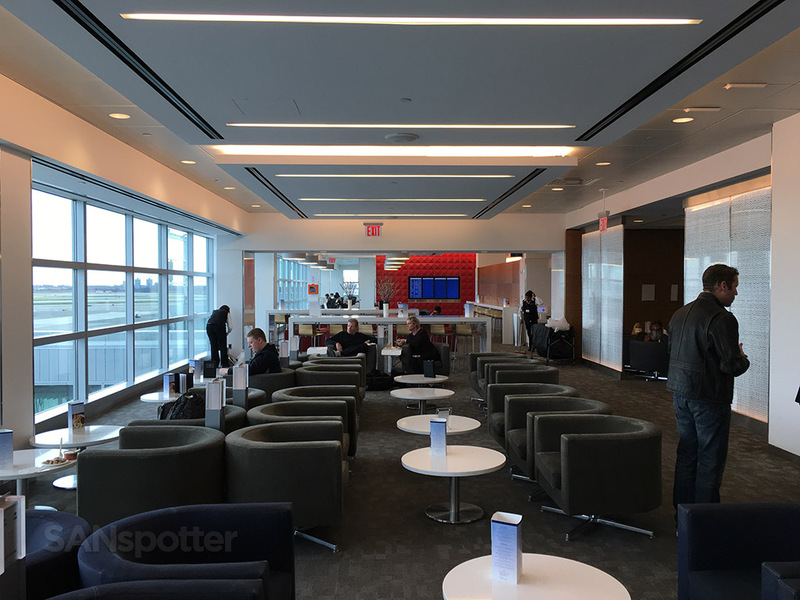 During the entire taxi ride to the airport, I was anticipating how good the Delta One lounge was going to be. 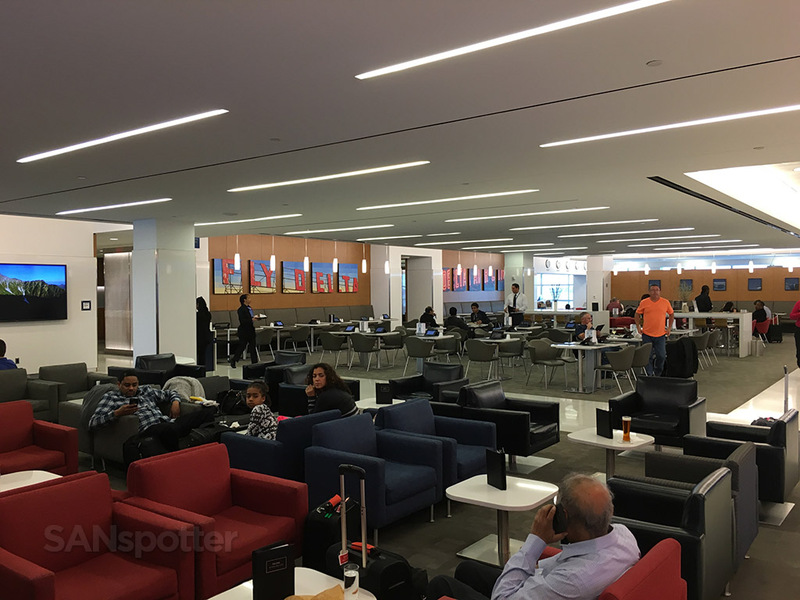 But once I arrived at the airport, I learned that there won’t be a Delta One lounge here until sometime next year. Darn! 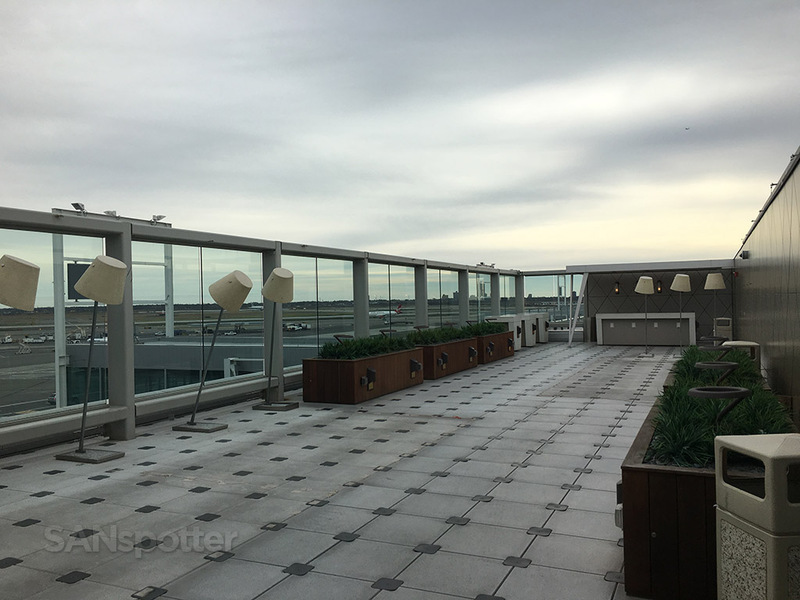 Oh well – I have heard that the regular Sky Club here was pretty good, so once again I was feeling a sense of curious anticipation as set off in search of it. 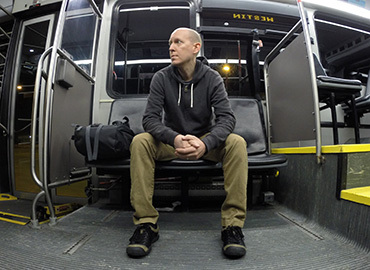 I walked. And walked. And walked. 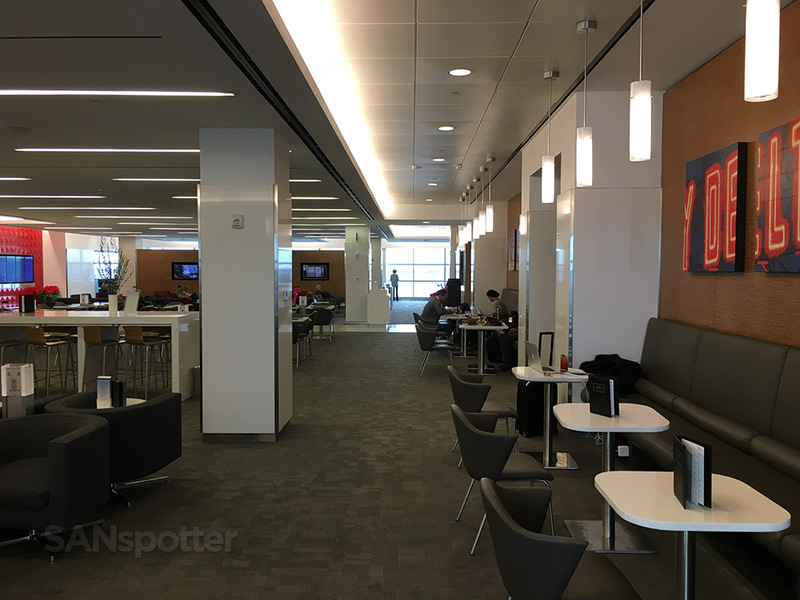 Long story short, the Sky Club here in terminal 4 is located nearly at the end of the terminal, so be prepared to walk if you want to check it out for yourself. 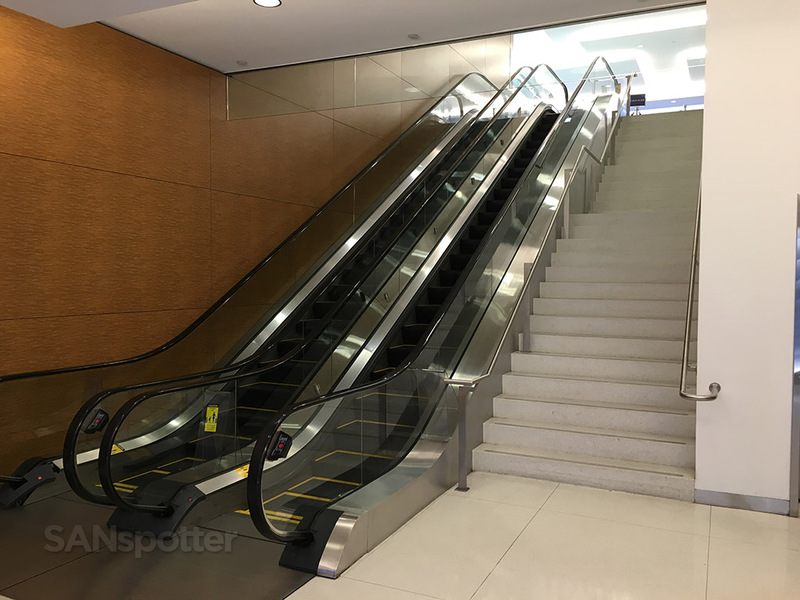 My spirits were slightly low as I walked through the signature blue sliding glass doors at the entrance to the lounge, but was quickly blown away once I walked up the stairs and saw the place with my own eyes. 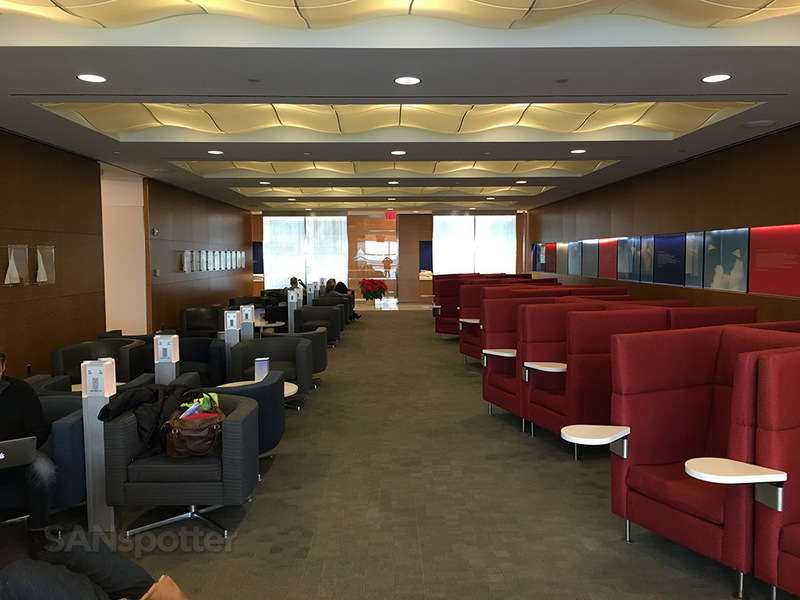 The size of this lounge is amazing! Feeling relieved once I was inside, I did a quick tour to get a sense of what this lounge had to offer. 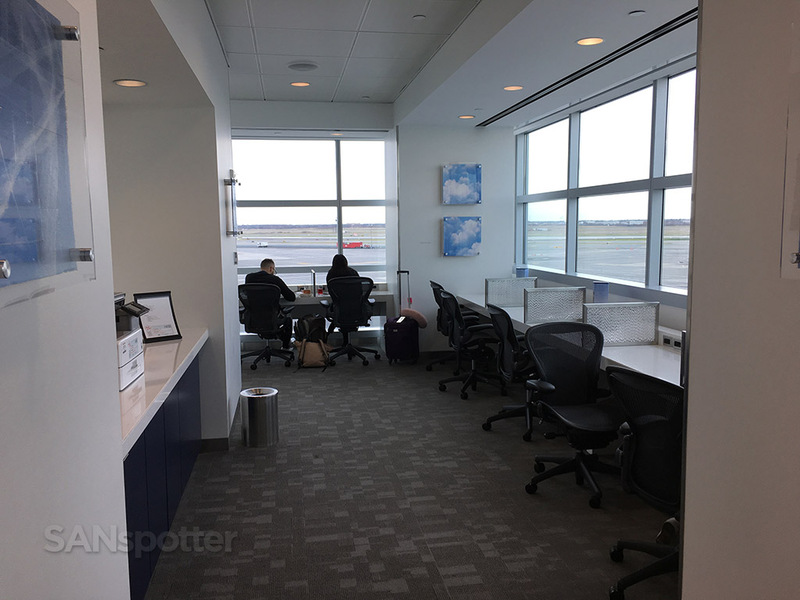 It was broken up into many rooms (both large and small), with a well-stocked business center and a nice “quiet room” with recliner chairs and flat screen TVs. This is the main room, which contains the bar and dining area. Self serve food is forward to the left. 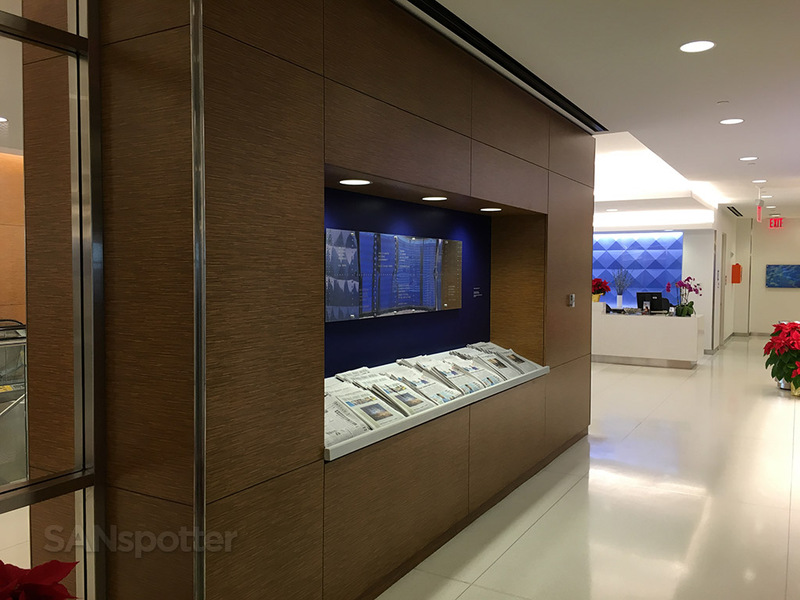 And for those that prefer complete peace and quiet, this “quiet room” would fit the bill nicely. 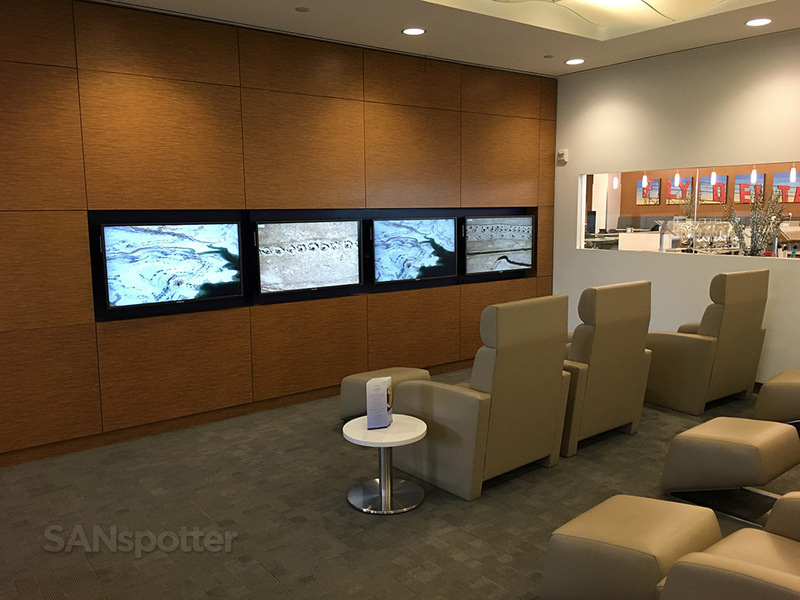 The business center – with a view! Food options seemed decent. 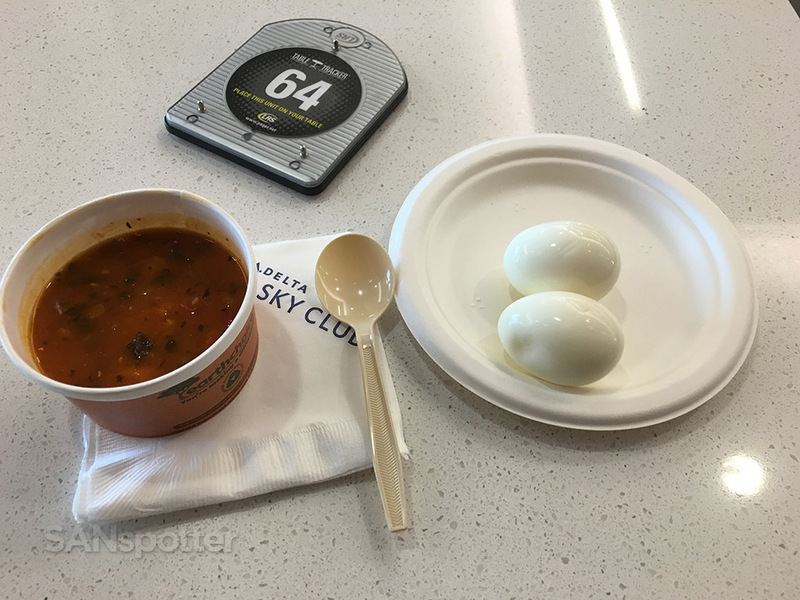 There was a small snack bar with two kinds of hot soups and a large bowl of boiled eggs when I arrived, along with a smaller bar consisting of simple snack items. I thought that seemed a bit weak, but I should mention that they brought out a plethora of other free hot-food items a couple hours later. I guess the point to be made here is that whether or not there will be food here is kind of a hit-or-miss thing. If you want a drink of any kind, you have to go to the bar. 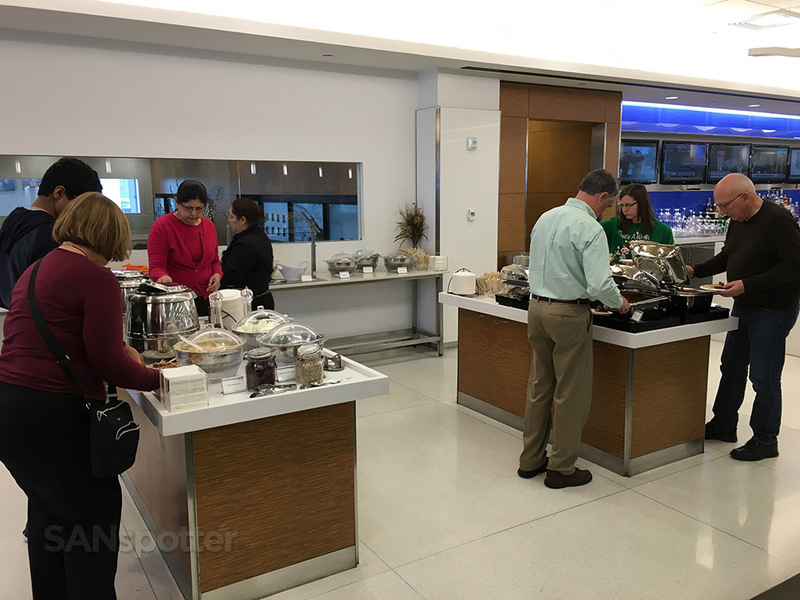 In addition to the free light snacks, there was a full menu of heartier for-purchase food available that looked pretty good too. 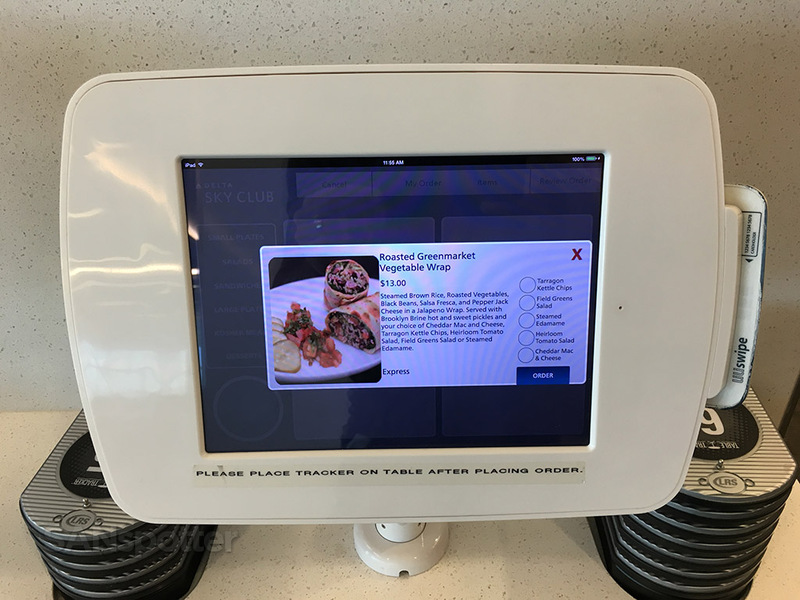 You could either order in-person via one of the many menus sitting around on the tables, or you could use the self-serve kiosk to order and purchase your selection. 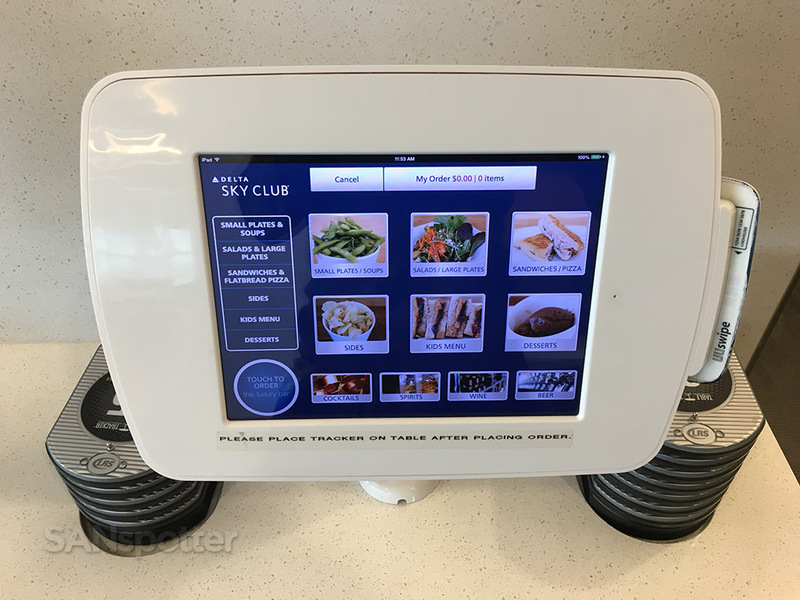 I chose to use the kiosk, and it seemed to work well except for the fact that it seemed to be taking a long time to have my order delivered to my table. I finally had to ask one of the staff members walking around to see if something was wrong with my order. She went to the back to check, and emerged with my meal in less than 30 seconds. It was a pretty good veggie wrap, but nothing I would consider really great. I was hungry, it tasted decent, and that was all that really mattered. 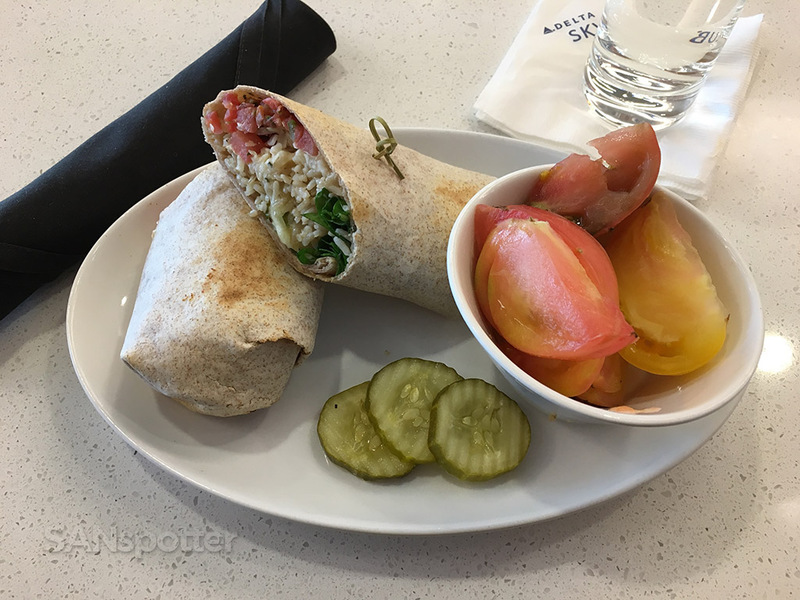 Here it is: the overpriced veggie wrap! It was ok – but far too salty for my tastes. 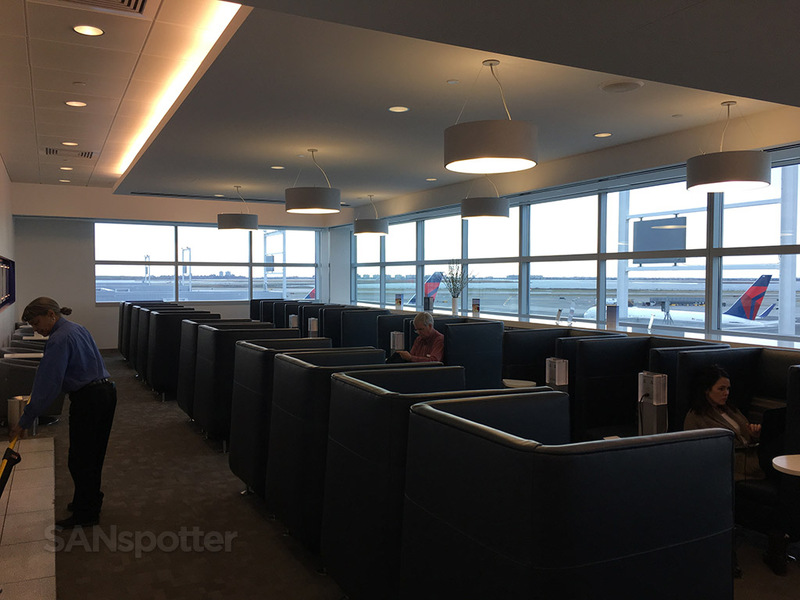 The only downside to this lounge seemed to be all the noise coming from the kitchen at times. They sounded like a rowdy bunch back there and I did find it to be a bit distracting. Not a deal breaker though – just a minor complaint that’s all. 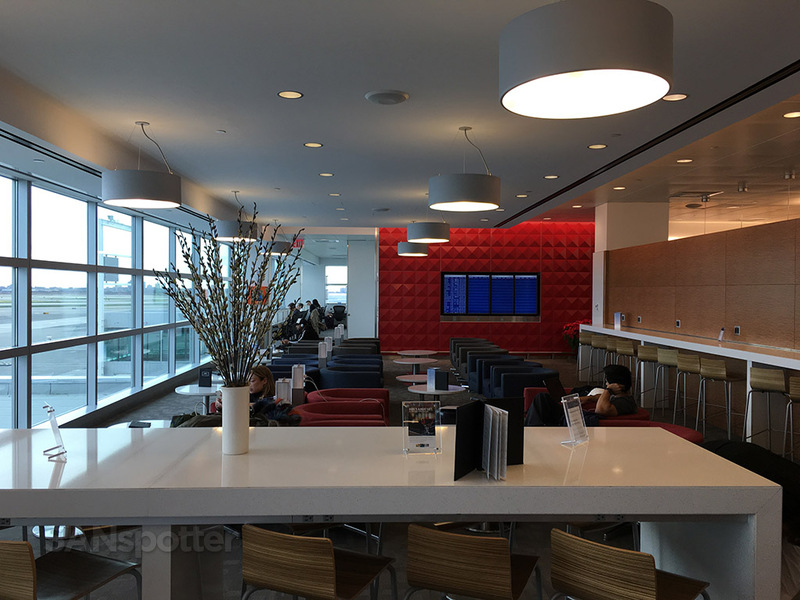 I love the use of the color red in Delta’s Sky Clubs. 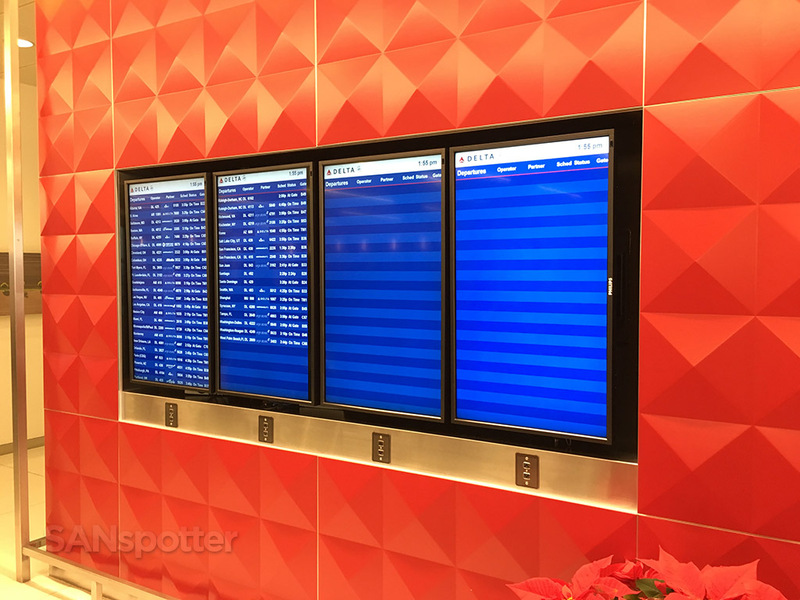 Here’s the flight information display wall. 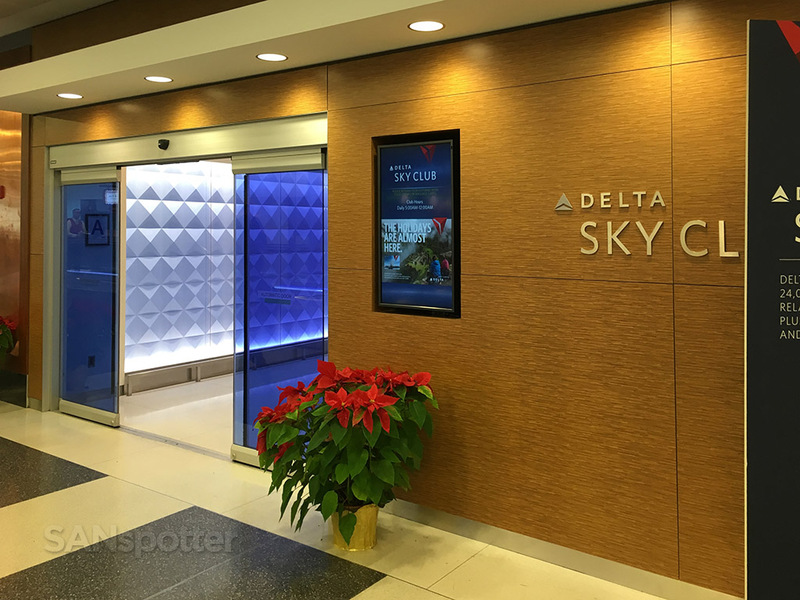 To sum things up, this Delta Sky Club really impressed me. 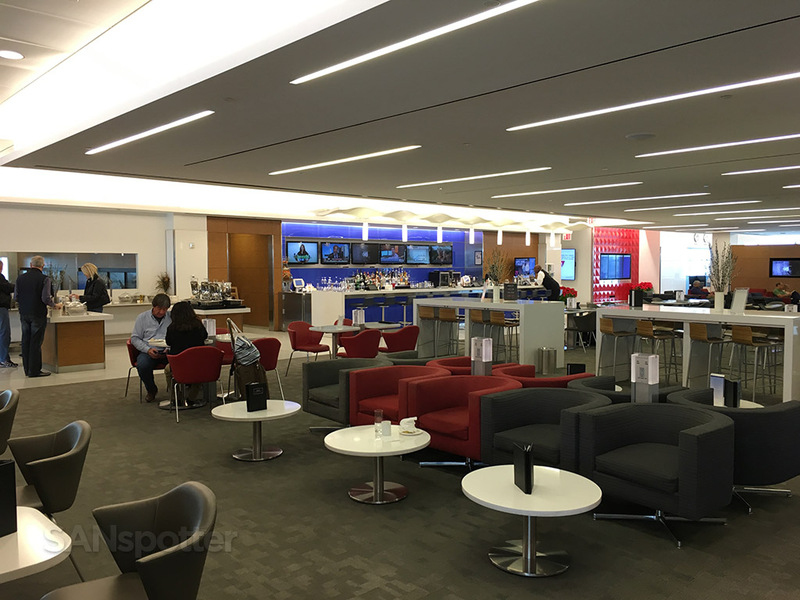 The San Diego Sky Club has been my favorite Delta lounge up until now, but this one at JFK is just like that one but x10. 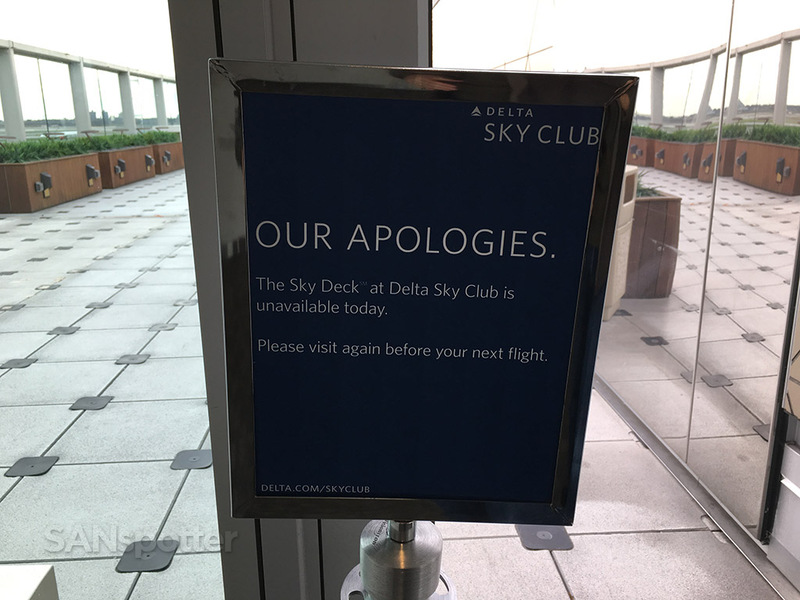 Well done Delta!